One of my favorite fruits to pick right off the tree is a fig. Sweet little fruits you can enjoy fresh off the tree each year. Here is how to get the most out of your Fig tree. Growth Habit: medium growth rate, wide form upon maturity. Plant multiple trees about 15 feet apart. Foliage: Deciduous in winter. Green forked leaves emerge in spring and last all summer. Fruit: Fruit will emege in spring and will ripen with time. Watch for color of your figs and check for tenderness to know when they have ripened. Fertilizer: Use a balanced fertilizer (8-8-8) in early spring at a rate of 1 lb. per year of age, up to 12 lbs. max. Pruning: Prune in late winter before foliage emerges. Edible gardening has become a popular hobby. We live in a great climate to do this in that our season is so long because of mild winters. You can reap what you sow here in South Louisiana. 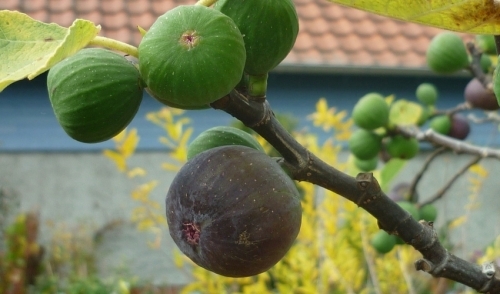 Figs are yet another example of a fresh edible you can enjoy in your home garden. Try one this season!